Flat Roof Restoration Is A Great Way To Spend Less, While Also Extending The Life Of Your Roof. Does your facility struggle with recurring roof leaks? Or perhaps its roofing system has sustained other forms of costly damage. If left alone, these problems can add up and create need for more expensive roof work. At ECO Commercial Roofing, we offer a solution that addresses these issues head-on. When you need repairs, a flat roof restoration in Texas, Louisiana, and Mississippi, may be the answer to your problems. For the majority of our roof restorations, we tend to use roof coatings.A flat roof coating system will strengthen your flat roof with a new, durable membrane which ends leaks. Plus it’ll seal off your aging roof from the elements and turn it into a renewed, energy-saving asset! To request a professional roof assessment, call us at (833) 200-0571. One of our contractors will be glad to discuss how a coating system will save money. Because they’re sustainable and re-coated when needed, our flat roof coating systems present durable solutions for your roof troubles. Call us to schedule an appointment for seeing whether your flat roof qualifies for a coating system! Coating applications will differ from flat roof to flat roof. After all, every roof is different. Each one comes with its own requirements and specifications. 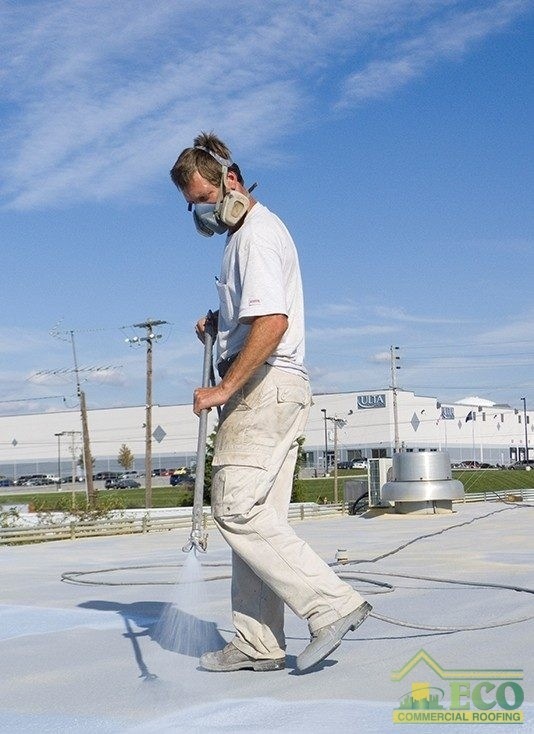 Plus it depends on the type of flat roof your facility has – coating applications will differ based on roof type. ECO Commercial Roofing would be glad to evaluate your roof’s condition and answer any questions you have. Don’t hesitate – contact us to request a professional roof survey and to discuss different possible service options! Call us today at (833) 200-0571 to request your flat roof restoration in Texas, Louisiana, and Mississippi. We look forward to the possibility of earning your business.